Halloween’s almost here! Who wants a Halloween candy coupon or two? | Cafe Arjun - 15 times WordPress Top Blog! Halloween’s almost here! Who wants a Halloween candy coupon or two? NRF (National Retail Foundation) is expecting the Halloween spending to touch five and a half billion dollars and you! Yes, YOU – an average person will end up spending 67 dollars on candy, costumes and other Halloween stuff with about $20 on mini chocolates and candy.. arghh! those trick or treat little devils!! 4. Over 2000 candies at CandyWarehouse.com – Coupon code BARGAINIST15 for 5% off and 5 dollars off for orders over $35.00. Offer expires tomorrow, so hurry. 6. Last but not the least, here’s a coupon from KMart. have picked this up from a website, hopefully it’ll work, but do print it out, take and take it with you for your Halloween shopping. 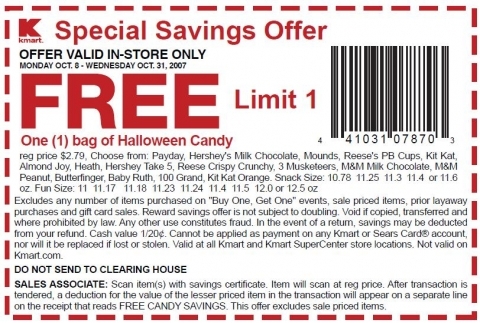 I’m sure there are 100s of more Halloween candy coupons out there. If you’ve found something better, please comment and share. ← Thank you Sarah Palin and WordPress – I’m a top blogger! Take a look at the coupon – It’s from 2007! Oh no! Why didn’t I see that.. will remove this as soon as I reach home.. ..
Has someone else found any printable Halloween coupons? Pingback: Biggest Halloween » Blog Archive » Halloween’s almost here! Who wants a Halloween candy coupon or two?